A brightly colored,sturdy board book for babies. 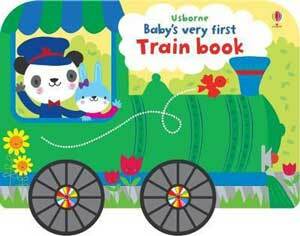 Follow Panda as he drives his train, picking up and dropping off lots of adorable animal characters along the way. With working wheels and sturdy pages this book feels like a toy truck in itself, making it a play book babies can enjoy time and time again. Board book, 6-1/2 x 9”, all-color photos, 8 pages. For infants or children in preschool.